Looking for practical, affordable, yet terrific favors for graduation? Our bottle stoppers are that and more! 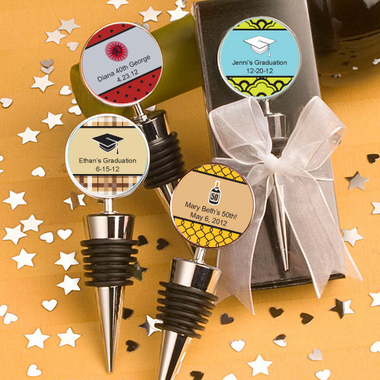 Each measures 3 3/4" x 1" and is made of silver metal with a black-rubber-gasket-wrapped conical base and a round metal disk top with an inset center which makes it easy to affix your personalized label. Each graduation favor comes gift packaged in a clear 'showcase' box top with a black base. The attractive packaging is finished with a white organza bow. Your order will arrive with the sheets of labels for you to affix.